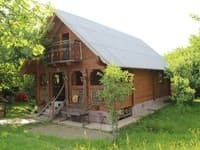 Hotel Lesnaya Skazka is located on the outskirts of Zhdenievo village near the village of Zbyny. There are 4 two-storey cottages with rooms of different categories for accommodation. The cottages have covered terraces with wicker furniture. Guests can relax in a sauna on firewood and in vats. There is also a zone with pavilions and barbecue facilities. For the comfort of the residents there is an autonomous water and electric heating. 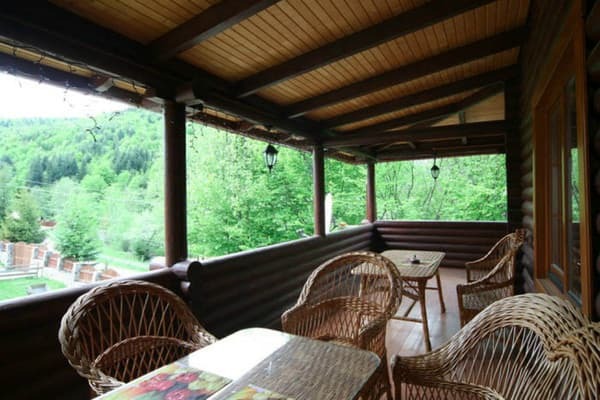 Guests can eat at the cafe-kolyba on site. The menu of the kolyba consists of dishes of Ukrainian and Transcarpathian cuisine. For those traveling by car there is a guarded parking for 20 cars. Bicycle rental and mountain excursions are available at an additional cost. 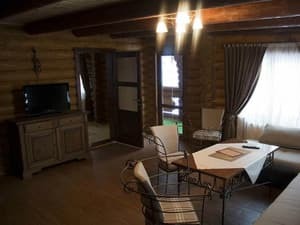 Hotel Lesnaya Skazka is located 600 meters to the ski lift and 9.4 km to the train station in Volovec. 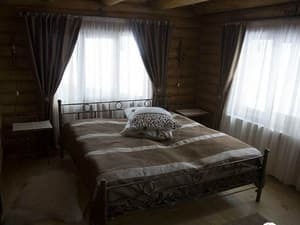 Description of the room: Cozy room with a double bed (possibly an extra seat in the form of a sofa). Description of the room: The spacious room consists of two rooms. The cost of additional space is 150 UAH (after a preliminary agreement). 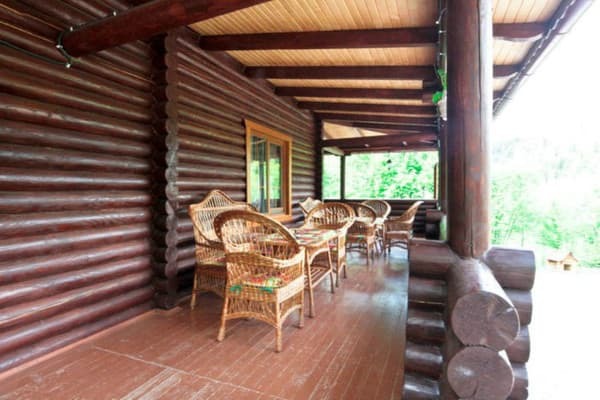 Guests can eat at the cafe-kolyba on site. The menu of the kolyba consists of dishes of Ukrainian and Transcarpathian cuisine. 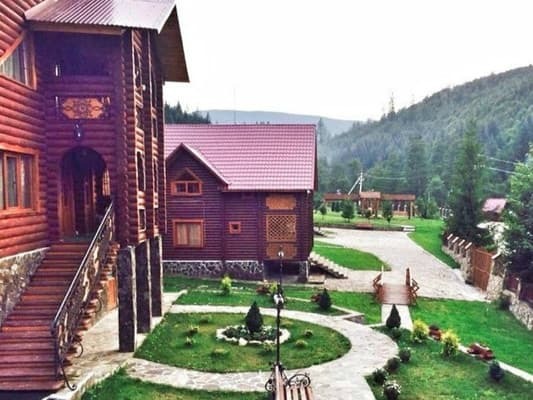 Hotel Lesnaya Skazka is located at the end of Zhdenievo village near the village of Zbyny. 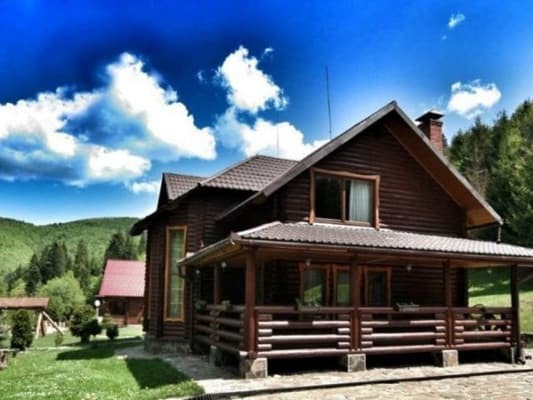 The hotel is located 600 meters to the ski lift and 9.4 km to the train station in Volovec. Trains Uzhgorod direction - to st Volovets, then by bus to the town of Zhdenevo. By car on the road Kiev - Lviv - Chop, for the village of Nijniye Vorota turn to the town Zhdenevo, after the sign of the end of the settlement at the fork, turn left and go to the house.